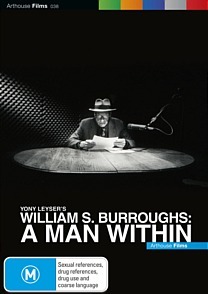 William S. Burroughs: A Man Within DVD Review A Man Within is simultaneously an excellent introduction to those not altogether familiar with Burroughs’ work and a must-see for avowed fans; regardless of previous familiarity, those of an artistic bent find plenty of insight and inspiration herein. Throughout the course of his long, singular life, American writer William S. Burroughs (1914-1997) crafted some of the most potent works of experimental literature ever seen, becoming, in the process, one of the most controversial and influential authors of the 20th century. His famed 1959 ‘cut-up’ novel Naked Lunch redefined existing paradigms of fiction, defying the limitations of the written word and garnering an obscenity lawsuit in the process, whilst earlier works like Junky and Queer introduced an unsuspecting American public to the topics of homosexuality and heroin use, previously considered beyond the purview of ‘civilised’ authorship. William S. Burroughs: A Man Within is the feature debut for nascent director Yony Leyser, whose self-avowed task was to try and encapsulate the essence of a man often seen as taciturn, alien-like and all but impervious to human emotion. Burroughs’ accidental murder of his first wife, early homosexual love affairs, his influence on the Beats and subsequent generations and his struggles with addition are all covered at some length, and help paint an engrossing picture of a man who was in his time, but never truly of it. Incorporating interviews with Burroughs’ friends such as Patti Smith and John Waters, longtime companion James Grauerholtz, as well ex-boyfriends, biographers, fellow authors and of course archive recordings of the man himself, Leyser cleverly layers clips of Burroughs’ readings and private life, period photos and private footage (much of it never seen before) and in doing so thoroughly succeeds in cracking the surface of this most unrepresentable of minds. The resultant portrait is as all-encompassing as could be hoped for in a single film, and though no 90 minute exploration of Burroughs could ever be said to wholly definitive many of the central themes and relationships of his life are nonetheless covered at some length. A Man Within is simultaneously an excellent introduction to those not altogether familiar with Burroughs’ work and a must-see for avowed fans; regardless of previous familiarity, those of an artistic bent find plenty of insight and inspiration herein.